After a while, Philadelphia’s omnipresent lunch trucks can blend together, fading into the backdrop of the city. 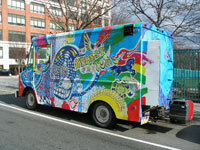 Enter the Lunch Truck Project, a Mural Arts Program bringing vibrant colors and eye-popping designs to our city’s mobile meals. The eye-catching trucks are a collaboration between Mural Arts, local muralist Shira Walinsky and West Philadelphia High School’s Artworks! Program. Like the recycling trucks Mural Arts designed in conjunction with the Streets Commission, the lunch trucks represent the organization’s new focus on working with local artists to take their projects from the walls to the streets. Beyond the project’s artistic merit, Golden hopes the trucks offer a larger message to their patrons. “The lunch-truck idea, beyond being an art project, speaks to the idea of immigration, the notion of journey, and how there is dignity and wonder in people’s stories,” says Golden. Although only a few trucks currently sport the graphic jackets—including Honest Tom’s, Koja, Candy Truck and Rami’s—Golden promises that the project will outfit many more.